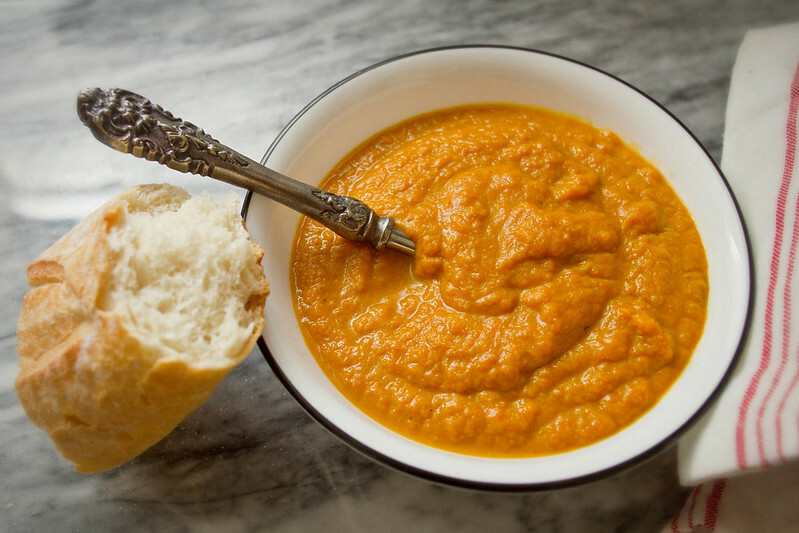 I cooked up a lovely batch of this soup last weekend, but only thought to photograph it after trying it and discovering just how delicious it was. Despite my few photos, I had to share it with you. It's lovely, the pumpkin and apple are an easy coupling of autumn flavors, and with the caramelized onion in there, it is basically a trifecta of my favorite seasonal tastes. It's officially cold in New York, and between the chilling wind, the brown leaves on the ground (where did they come from? I don't see any trees. ), and the short days, it's clear Winter is not far off. This time of year just makes me want to bake apples, roast winter gourds and sweet potatoes, slow cook huge pots of beef stew, and eat a lot of gravy. 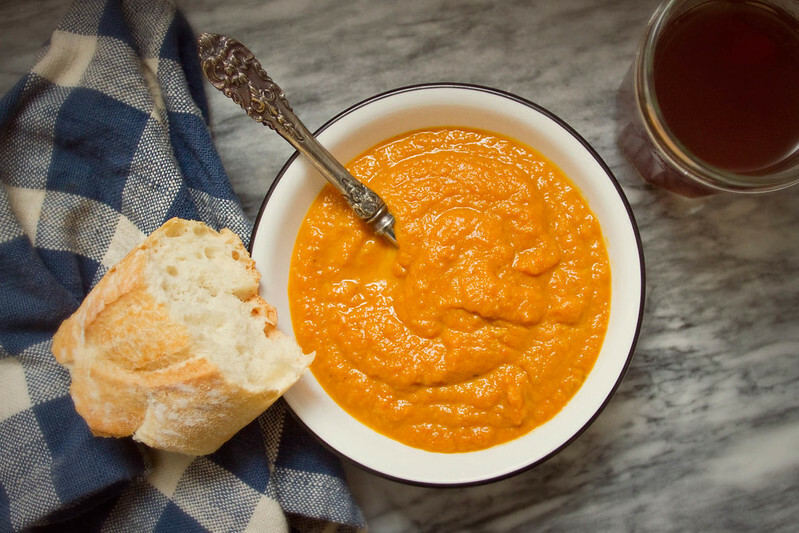 This soup addresses many of my autumn flavor needs, is thick and hearty, and has a lovely rich orange hue. It's a celebration of the late autumn harvest, and would make a great first course on Thanksgiving. Chop the carrots, onion, and apples. Add about 2 tsp olive oil to the bottom of a large soup pot and add the chopped onion. Cook over medium-low heat for 5 minutes, until onion has softened and turned transparent. Add the carrots and apples, mix, and cook another 5 minutes. Sprinkle allspice and cinnamon over apples/onions/carrots, mix well, cook another 1-2 minutes. Add the apple cider in splashes, while mixing the pot, to deglaze the pan. Mix thoroughly, then add the chicken stock. Bring to a boil, then reduce to a simmer and cook for 30-40 minutes, until carrots and apples are soft. Add the pumpkin puree and milk (or be bad like me and use half'n'half), mix well. Remove from heat and puree, either in batches using a blender or food processor, or with an immersion blender, until smooth. Return soup to pot, and heat over low for another 5 minutes, mixing occasionally, then serve. Cut pumpkin in half, scoop out seeds, cut into quarters and bake, flesh up, on a cookie sheet in a 350 degree oven for 35-45 minutes, until flesh is soft when poked with a fork. Peel off the skins and puree the pumpkin in a food processor or blender until smooth. If you want to thin it out a bit add a splash of apple cider.